These fun and friendly dog toys have a super-soft, plush fabric outer layer that dogs love to cuddle and toss about. For increased durability, a second, inner layer of nylon fabric is added. A squeaker is included to further entice the lucky canine. Even the squeaker is protected in its own durable fabric pouch. Owners can choose from a collection of ten colorful and ultra-cute characters: Ali Alligator, Baily Puppy, Buster Koala Bear, Elmer Elephant, Floppy Bunny, King Lion, Marvin Moose, Rosie Rhino, Spunky Monkey and Tupper Lamb. 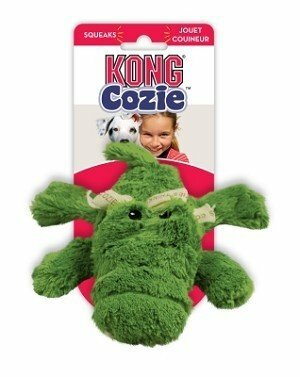 KONG Cozies are sure to please any dog and will likely become their comfort toy of choice.